It can be easy to forget that we live in a little provincial bubble in Lincolnshire. The campaign to save Lincolnshire's libraries from drastic cuts has had quite a lot of attention in our regional media, both in the papers and on the local TV and radio news. However, this issue hasn't gained the national attention it deserves, as I learned when I went to World Fantasy Convention in Brighton over the weekend. WFC is a large convention of people who work in speculative fiction publishing, with authors like Trudi Canavan, Joe Abercrombie, Neil Gaiman, Robin Hobb and Terry Pratchett in attendance. 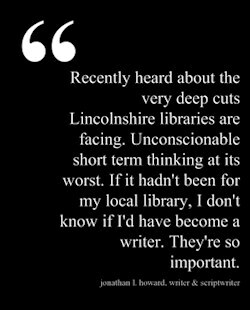 So I got the chance to speak to tons of authors there, and I told many of them about the situation with Lincolnshire's libraries. And when I did so, jaws dropped in shock at the sheer scale of the cuts. These were writing professionals who would be more likely than most to follow library news, so this was confirmation for me that news of our proposed library cuts, drastic and scandalous though they are, hadn't reached a national audience. However, every single person I spoke to about them condemned what was happening. After the convention was over, many of them took to social media to express their outrage. Adrian Tchaikovsky, author of the Shadows Of The Apt series published by Tor, tweeted "I learned to love reading at Horncastle Library. Save Lincolnshire's libraries!" "Unconscionable short term thinking at its worst." is how Jonathan L. Howard described the proposed cuts. Jonathan used to be a librarian, before becoming an acclaimed video game designer and the author of the Johannes Cabal series, published by Headline, as well as penning the Russalka series published by Strange Chemistry. He wrote: "If it hadn't been for my local library, I don't know if I'd have become a writer. They're so important." Short story writer Glen Mehn condemned the "astounding & terrible cuts", whilst Adam Dalton recalled Neil Gaiman's comparison of closing libraries with stopping vaccinations. "We're all gonna get sick", Dalton tweeted. Incidentally, whilst I'm in full name-drop mode, I did manage to talk to Neil Gaiman very briefly during WFC. I thanked him for promoting Save Lincolnshire Libraries, and he encouraged me to keep up the campaign. 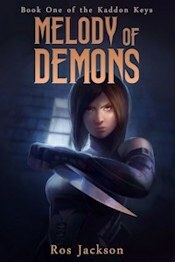 "I <3 libraries, & any lost saddens me" tweeted Suzanne McLeod, author of the Spellcrackers urban fantasy series. "Another fight to save libraries is happening now, in Lincolnshire", Emma Newman tweeted. Emma has been involved in a campaign to save her local library in Somerset. It's desperately sad that what we're experiencing in Lincolnshire is being echoed in so many other places around the country. 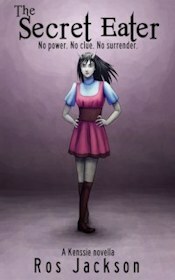 Emma is the author of the Split Worlds series of contemporary bad fairies, published by Angry Robot. I have it on good authority that bad fairies are the hot new publishing trend for 2014*. Anne Lyle, author of the BFS Award-nominated Night's Masque series, tweeted "I owe my writing career in large part to small local libraries, esp in my home county of Notts (next door to Lincs)". Gareth L Powell, author of the Hive Monkey books, offered this tweet of support: "Libraries are under threat in Lincolnshire. If you'd like to protest against closures, please support @savelincslibs". Adrian Faulkner, author of The Four Realms, wrote an impassioned blog post about this issue. He wrote: "They are the most democratic places, with knowledge open to all, and whilst how we interface with knowledge is changing, there�s always going to be a need for libraries as a way to provide free access to that knowledge." 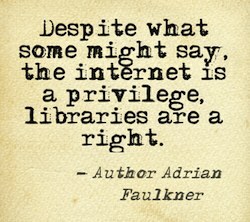 "Despite what some might say, the internet is a privilege, libraries are a right." Comics writer Al Ewing, and author Joanne Hall both promoted the @savelincslibs campaign to their followers, whilst historical fantasy author Clifford Beale wrote that "closing a library is like a death in the family." He compared the proposed cuts to "mass murder against literacy in the community." A lot of other news is coming out about libraries, as the results of the consultation have been released, and roundly criticised by Save Lincolnshire Libraries. There are also moves to privatise the library service, with GLL and Bibliotheca expressing interest in Lincolnshire. Alan Wylie's blog on this issue offers worthwhile commentary. On Thursday, November 14th at 6.45pm, Andy Howlett and Colin Pitman will be presenting a talk in association with Louth Area Autism Family Support. Mr Howlett will be talking about statementing, whilst Mr Pitman will discuss his book, The House That Talks, which is about the experience of having a family member with autism. Just Sing is a new singing group that meets in the back room of My Father's Moustache, to sing a range of songs from pop to musicals to folk. They welcome the "tonally challenged" and sing just for the fun of it. They meet on Wednesday evenings, for a contribution of just �1. If you fancy coming along or want more information, give Kate a ring on 01507 600064 or email katekmh@btinternet.com. On the other end of the price scale, Rock Choir meets on Thursdays from 10am-11.30am at the Trinity Centre. They cover pop, Motown and chart songs, and they also do not ask anyone to do an audition. You Can Sing is also currently rehearsing for a Christmas show on 1st December, featuring music from various musicals as well as a few Christmas songs. This group mixes up singing with some low intensity dance routines, and it meets at the studio near St Michael and All Angels Church, on Church Street, from 5-6pm for kids and 6-7pm for adults. Also on a musical theme, Louth and District Concert Society provide six professional concerts a year. You can telephone the chairman Mike Smith on 01507 609901, or secretary Neil Sharpley on 01507 606371, if you'd like to get involved. 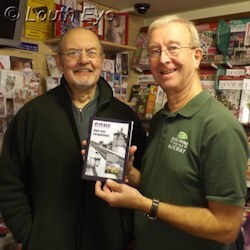 Alf Ludlam and Phil Eldridge were in Wrights' of Louth today, signing copies of their new book, Gone But Not Forgotten. The illustrated book looks at the old railway stations in Lincolnshire, and what has become of them since the Beeching closures. All proceeds from the sale will go to the Lincolnshire Wolds Railway. LWR is in the process of moving to charitable status, which will allow it to raise more funds. At the moment the organisation is at the stage of having restored a little over two miles of a possible eight and a half, in order to extend the route to the edge of Louth's industrial estate. * I like them, and certain major publishers have said they aren't sick of hearing about them. That makes a trend, right? Send in your news or comments about Louth. Let us know about local events. Whilst Wolds Words celebrates literature and nurtures new talent, local novelists have released new work in a range of genres. The county council executive met to make their final decision on library cuts. Bibliophiles may want to look away. The county council reveals its figures for library support services. They make for brief reading. The fight to save Lincolnshire libraries from the drastic cuts planned by Lincolnshire County Council goes on. Neil Rhodes has been suspended, but we have no idea what he has done, if anything. Luckily there are two books and a show to keep us entertained while we speculate. © Louth Eye. All rights reserved. Web design and text by Ros Jackson, unless otherwise specified.